Thanks to the nice article in this week's Los Gatos Weekly Times, I suspect there may be new people visiting this blog for the first time. Welcome! Please scroll down and read from the bottom up if you want to follow My Year As Mayor in chronological order. One correction to the article -- I'm “wary” of people wanting to talk about town issues on my blog, not “weary.” This is not the forum for policy discussions, but I am always happy to hear from residents by email, phone, or correspondence about upcoming Council agenda items or other Town concerns. This has been a typically-busy week for mayor duties. Lots of meetings including an exciting session at the Santa Clara University Markkula Center for Applied Ethics helping to brainstorm topics for a two-day ethics camp for public officials at SCU in June. Nice to see former LG mayor JOANNE BENJAMIN there in her new role as Executive Director of the Santa Clara County Cities Association. 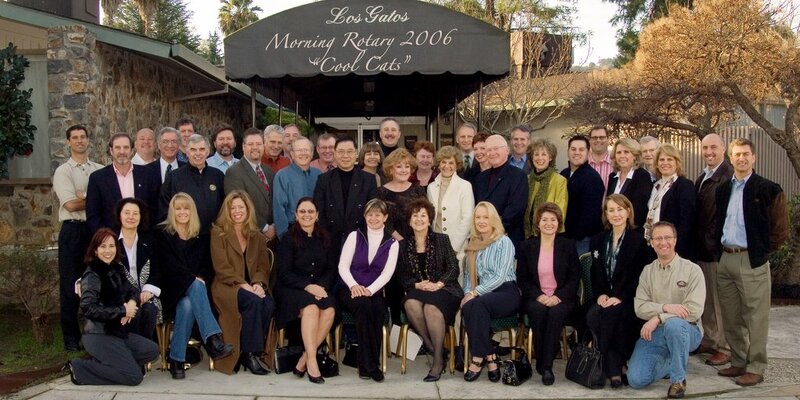 I also had a good time yesterday as the guest speaker at Los Gatos Morning Rotary. I spoke to the Noontime Rotary group in January. Both clubs are incredibly active in their support of Los Gatos. Here's a photo of the morning group. How many people do you recognize? Thank you to Program Chair JULIE DINAPOLI for the invitation and President DARRELL MONDA for the warm welcome. I think this is a great idea. Open government is good government. Keep up the good work. Thanks, Diane, for visiting our club and for the wonderful insight into your mayoral objectives for the year. Your speech was informative and interesting, and I am certain that you will successfully serve the town of Los Gatos. Cheers to you.